Last Tuesday I was getting ready for a Parish Pastoral Council Meeting, but when I went to the filing cabinet to retrieve the relevant folder, I couldn’t find it. How could a whole folder go missing? I went through every file, in every drawer, in the filing cabinet. I took them all out, and put them all back in again. It was nowhere to be found. I went through every other press in the office but all to no avail. I wracked my brain to try and remember when, and where, I had last consulted this file. I forlornly searched every other place, office, room, and hall, where I could have conceivably misplaced it. Nothing. I had even been informed that the key had broken off in the Saint Antony Shrine box in the church, and in my demented state of mind, I interpreted this as Saint Antony not being able to help me either. Those of you who have had this experience will know that the search can very quickly become an obsession. I could envisage sleepless nights ahead going through it again, and again in my mind. Where had I put it? The only positive thing was that I was doing some much needed tidying up and clearing out as I went along. After a couple of hours, having given up completely, I was retrieving something else from a press that I had searched about four times already. My attention was drawn to a black box file. Suddenly, a light went on in my brain. Sometime after the previous month’s Parish Pastoral Council meeting, I had decided that the folder was getting too full to comfortably be accommodated in the hanging suspension file in the cabinet, and so I had transferred all the material into a box file, but I had no recollection whatsoever of doing this, until then. The joy of the woman finding the lost coin; the shepherd finding the lost sheep, and the father welcoming the lost son, was also to be found in me. My joy was complete. This isn’t the first time I have devoted my log to this theme. A couple of years ago I misplaced my driving licence, which I later found in page 34 of the Glenstal Prayer Book, marking Psalm 26 for Tuesday Evening Vespers, which contains the verse: “It is your face, O Lord, that I seek, hide not your face”. At that moment, the Lord’s face seemed a lot easier to find than my driving licence. I have regularly misplaced my passport, my keys, my wallet, my phone, and so on. The common denominator seems to be when I always keep something in the same place, and then for some mysterious reason, dredged from some rarely used part of my brain, I decide that there is a better, safer place to keep it, and I change. The next time I want the said item, I go back to the place where it had always been kept, only to find it not there, and being without a clue as to the new “better, safer” place I had transferred it to. The biggest thing I’ve ever lost was my car, in the long-term car park at Dublin Airport. I was rushing to a meeting in Holland when I was secretary to the North European Conference of Passionists. The meeting began on a Thursday evening and was due to end on the Saturday evening. I had booked a flight back from Amsterdam to Dublin on the Sunday morning and had scheduled myself to celebrate public Mass in Mount Argus at 4pm on Sunday afternoon. The only thing was that I had forgotten to take note of where I had left the car, so that, on arrival, I really didn’t have a clue where it was. After searching, but to no avail, I had to call the monastery and ask if there was someone who was able to celebrate the 4pm Mass for me. A long time later I found the car and eventually made it home. A lesson learned? Maybe! The ironic thing is that I decided to write about this incident in the following week’s bulletin in Mount Argus, which then turned into a regular feature, and that is what has now segued into Father Frank’s Log in St. Mungo’s. My intention is to convey that, in the most ordinary, mundane, funny, and even ridiculous events of everyday life, God is there – always. I was traveling to Dublin last Sunday night for meetings on Monday and Tuesday. I had left after the Morning Masses and the RCIA session with our Elect in St. Mungo’s, with the intention of having a bite of lunch at the airport and then finding somewhere to watch the San Marino v Scotland match. Lunch was just okay, but, fortunately as it turned out, there didn’t seem to be anywhere showing the football, so I was spared an abject Scotland performance. The gate number went up for the flight and I made my way to the departure area. I watched the incoming flight from Dublin land and, almost immediately, as soon as it had come to a stop, we were called forward for boarding. Great, I thought to myself, the plane is going to leave on time. We queued up on the stairwell, waiting for the doors to open on to the tarmac where the plane was sitting, which is the part I dislike most, cattle being herded. We waited, and we waited, and we waited. Nothing happened. A low murmur of complaint from passengers began to spread. Eventually, a message was relayed from above that there was a bit of an emergency, and that paramedics had been summoned to attend someone still on the plane. The murmurs of complaint came to a halt, someone was sick. We remained on the stairwell, not knowing how long it would take. We watched the paramedics arrive and board the plane. After a while we were told that they were going to recall us to the departure area, and that we would have to repeat the boarding process when the all clear was given. To be honest, it wasn’t too long after, and in the apologies that emanated from the crew as we boarded the flight, there was conveyed a sense that the person who had taken ill was okay. My thoughts drifted back to about 15 years previously. I was with a group of parishioners from Mount Argus in Dublin on our annual pilgrimage to Lourdes. It was the year Lourdes had installed the water walk on the opposite side of the River Gave from the Baths and the Grotto, as part of the build up to the 150th anniversary of the Apparitions which took place in 1858. We had enjoyed a wonderful trip and were waiting at Tarbes Airport for the plane home to Dublin. The flight was called, but as we passed through security an alarm suddenly went off and the gates were closed. Through a partition I could see one of my pilgrim group, a lovely lady, lying on the ground and surrounded by anxious looking staff. I was allowed through to where she was but I could only stand helplessly by as some kind of medic tried to resuscitate her. After a couple of minutes, the medic looked up and said “she’s gone”. So many thoughts flashed through my mind in a split second, including how I was going to tell her husband and family. As I moved in to anoint her, an angel of mercy appeared in the form of an Irish nurse who was with another pilgrimage group, who had seen what was happening. She cleared a space for herself in a no-nonsense way, like Hattie Jacques in Carry on Matron, and, with some kind of blessed touch, brought my pilgrim back from the dead. We were brought to a medical room at the airport. A doctor appeared and took over the situation. By now the good lady was conscious and apologising to everyone for all the fuss. Reluctantly, the doctor allowed her to board the flight with us, but only because we had discovered another doctor who would be on the flight, who promised to keep an eye on her. The flight felt like the longest I was ever on, and when we touched down in Dublin an ambulance was waiting to bring her to the nearest hospital. It was only then that she would let me phone her husband and tell him what had happened, and where she was. She stayed in hospital for a while, but they never did get to a full explanation of the cause. Thankfully, she recovered well. Paramedics, nurses and doctors; where would we be without them? Heavenly Father, we thank You for those men and women who have dedicated themselves to nursing the sick and dying, and we pray for You to give them strength and grace as they tend to the ailments, injuries and sicknesses of so many people in their care. Amen. Last week I had to finally admit that my Passionist Habit had reached the point of no return. It was the last habit ever made for me, and it was made by a lady in Dublin back in 1994 when I was heading out to South Africa and Botswana to work for a year in our Vicariate; to do some work in our parishes and with our young Passionist students. After 25 years then, it didn’t really owe me anything. My only habit before that had been the one made for my First Passionist Profession in 1980. I still wore that one at the time, but I had wanted something lighter for the hotter climate in Southern Africa and so this lady, who worked in our kitchen in Mount Argus in Dublin, kindly took on the task, and a good job she made of it too. In recent times various seamstresses had managed to do a remedial job, but it had now reached the stage where no more could be done and, sadly, I had to bid it farewell. My first thought was to get a new one made, but that’s easier said than done, as not too many people have the skill and the knowhow. At first glance a Passionist Habit may seem to be a simple garment, a black tunic with a leather belt, and our distinctive Passionist sign, a heart worn over the heart, bearing symbols of Christ’s Passion. But, in reality, our Passionist habit is a very intricate garment, made to a very unique pattern. The stitching represents the wounds of Jesus and the sorrows of Mary, and there is a hidden pocket that may or may not have been a handy place for the religious in days gone by to keep their snuff. Nowadays it’s more likely to be used for a handkerchief. I then discovered that, in the sacristy presses, there were quite a number of habits that had belonged to Passionists from years gone by, but who had now gone to God. One afternoon, when the church was closed, I began to work my way through them, trying them on as if I were in a fitting room in Marks and Spencer’s. As I did so I began to speculate on who might have worn these habits in times past. I remembered Jock Stein’s famous quote about the hoops: “Celtic jerseys are not for second best, they don't shrink to fit inferior players” Could the same be said about the Passionist habit? Trying to find one that was the right body length, sleeve length, and neck-size, was a bit like looking for a needle in a haystack. Just as I was about to give up, I pulled out a very dusty garment from the back of the press. I almost cast it aside immediately, it looked so grubby. I decided to try it on anyway, and, without a doubt, this would be my last go. And would you believe it, it fitted perfectly; length, arms, and neck, all as if it were bespoke made for me. The next question was, how would it clean up? It was a heavy woollen garment, much heavier than anything I was ever used to. I took it home and threw it in the washing machine. I gave it an extra spin when the wash was finished, and then I hung it up to dry. I left it for a couple of days to dry it out thoroughly and, at the end of it all, I put it on, and it still fitted perfectly. Who did it belong to? I have no idea - but he was obviously a finely built specimen like myself. Next year, 2020, we will celebrate the 300th anniversary of the founding of the Passionists by St. Paul of the Cross. You may have been aware that recently, we had here in St. Mungo’s a special Passionist jubilee icon that is travelling around the world, wherever there are Passionists, to help us prepare for this celebration. The Passionist habit has a very important place at the beginning of that story that is worth recalling, and it may give a sense as to why the habit is so important to us. In 1718, at Sestri, outside of Genoa, at Our Lady of Gazzo Church, at 21 years of age, Paul saw himself in a vision. He was clothed in a black tunic and filled with a desire to lead a life of poverty and reparation. He wanted to call others to join him. Two years later, in 1720, at a local Capuchin Friary, Paul prayed fervently for an understanding of what had happened at Our Lady of Gazzo Church. On his way home he received a vision of the Blessed Virgin Mary clothed in a black tunic and wearing the Passionist sign. Mary told him to gather companions, and to establish an Order that would mourn the death of her Son, Jesus Christ. On November 22 of that same year, Bishop Di Gattinara of Alessandria vested Paul, in what was later to become established as the Passionist Habit. Earlier today I came back from the post office and, as I parked the car in the yard, I noticed the door open from the yard into the church hall area. As that would be the quickest route to my office I slipped in and thought no more about it. As I sat having a cup of tea with two of my Passionist colleagues, Father Paul Francis and Brother Antony, we became aware of a bit of a stramash outside. Then we heard the unmistakeable cooing of pigeons. As it turned out, two pigeons had found their way in through the open yard door and, as most of you probably know, once pigeons find their way in to somewhere, they are not so easy to encourage out again, and are very likely to leave their calling card. We just sat drinking our tea, knowing that more capable people than us were dealing with it. It wasn’t my first experience of this. The new monastery at Mount Argus in Dublin has a beautiful atrium, but with an awful lot of glass panels. One very warm day, when one of the panels was open for air, a pigeon found its way in, and it was heart-breaking to see the poor bird frantically flying, again and again, into every panel except the one that was open. I think I had heard somewhere that they will never go back out the same way they came in. That would explain a previous encounter I had when I was parish priest at St. Gabriel’s in Prestonpans in the late 1990’s. St. Gabriel’s was one of the first churches in Scotland built after Vatican II with the post-Vatican II liturgy in mind. There was only one way in and out of the church, and that was through the front doors. The walls swept around in a curved arc towards the sanctuary over which, at first, there hung a figure of the Risen Christ. The good Catholics of Prestonpans, however, yearned for a traditional Crucified Christ, and this was provided thanks to a kindly bequest, the Resurrection Cross finding a new home in a side-chapel. I’m not too sure what the architect would have thought of this, I doubt that he would have been too happy, but the people were happy, and thought that this was a much more fitting image to have in a church ministered to by the Passionists. The only windows were of stained glass, very high up. They were more like narrow slits and were never opened. On this particular day a pigeon found its way in through the front door and perched itself on a ledge high above the sanctuary. Now and again it would take flight around the church and then futilely crash into one of the narrow stained-glass windows in an attempt to get out, but no amount of shooing would encourage it towards the front doors from which it had entered. There was an evening Mass to be celebrated later and I wondered what would happen. Then a lady appeared in the church to say a few prayers. When she saw what was happening, she said that her son was a pigeon fancier and that she would ask him to come along and advise us. Half an hour later her son appeared with his pal, a very long ladder, and a blanket. The pal held the ladder while he climbed up, carrying the blanket. Within seconds he had the pigeon wrapped in the blanket, climbed down the ladder, went outside and unrolled the blanket, thereby setting the pigeon free to fly happily on its way. There is no better solution to anything, other than someone who actually knows what they’re doing. Getting back to St. Mungo’s earlier today. Together with Brother Antony, I had to make my way carefully out, past what looked like a lot of feathers, and other stuff, to celebrate Mass in the Glasgow Caledonian University. When we returned, an hour or so later, the pigeons were gone, and the place was beautifully cleaned up. I got the impression, however, that I shouldn’t ask too many questions as to how this was achieved, and I unreservedly took the hint. It took me back to my student days when my class came to St. Mungo’s to help out in the Holy Week Ceremonies. This was when Father Michael Doogan was rector and parish priest, and Father Paul Francis was the vicar. For the Easter Vigil Father Michael, who liked a bit of liturgical drama and symbolism, had set two white doves, which of course belong to the same bird family as pigeons, in a cage on the sanctuary. Thankfully they didn’t escape, and the Vigil passed peacefully. Last Monday morning I dropped some papers down to the Archdiocesan Offices on Clyde Street. I had to be back in time for the lunchtime Mass, so I paid a quick visit to St. Paul’s Multi-Media to see if they had anything nice in for Lent, and then started my journey back along Argyle Street. I immediately became aware of a long line of people, about 6-deep, and stretching way back towards Glasgow Cross. I though at first it might be some kind of protest, but I couldn’t see any placards indicating what they might be protesting about. I further realised that most of the crowd, although not all, were young people, and many of them seemed to be wearing some bright yellow item of clothing. More than curious, I approached one of the stewards, and he informed me that there was to be an album signing in HMV by an American musical duo called 21 Pilots, and it was then that I could see a lot of the young people wearing hoodies with 21 Pilots written on the back. I have never heard of 21 Pilots and I have no idea what kind of music they play, but before I could rush to judgement on the daftness of wasting a whole morning, or more, queuing to get an album signed, I was reminded of a few daft things I did in my own younger years in relation to my favourite American musical duo, Simon and Garfunkel, back from the mid 1960’s until 1970, which was when the Bridge Over Troubled Water album came out. One day, it must have been late 1970 or early 1971, my brother Hugh and his then fiancé Janet, now his wife of almost 50 years, came home from a trip to Helensburgh and told me they had spotted a Simon and Garfunkel album that I didn’t have in a music shop window. This was impossible, they had only made 5 albums up to that point and I had them all, I was sure of it. They wouldn’t let up, and, before the day was out, I was on a train from Drumchapel to Helensburgh to check it out; and sure enough, there it was. I purchased it immediately and brought it home with great excitement, longing to hear these songs that I never knew existed. As it turned out, it was an album of songs they had recorded in the 1950’s under the name of Tom and Jerry, imitating their idols, the Everly Brothers, with such exciting tracks as Hey Schoolgirl in the Second Row, and be-bop-a-lops cropping up everywhere. After listening to Bookends, and Bridge Over Troubled Water, this was truly dreadful. That mad trip to the coast really was a waste of time. Not a waste of time, however, was when, the night before my final Theology exams in Dublin in June 1982, I abandoned my studies to attend an open-air Simon and Garfunkel concert in the RDS. It was wonderful. I returned to that same venue in July 2004 for their farewell tour, and the backing band that night was none other than the Everly Brothers. Now, what did I do with that Tom and Jerry album? I hope those young people queuing up for the 21 Pilots signing had a great day and were thrilled with what they got. I’ve no doubt that they did. It’s a special feeling to be really grasped by something that brings you great joy, whether it’s a favourite band; a favourite writer; a favourite place or a favourite person. I can still have that experience now, but I suppose the older I get the more I realise that such joys, great as they are, don’t reach the deepest places, at least not for long, and that really it is being grasped by God that truly satisfies and fills the heart, but it’s wonderful to experience all the little grasps along the way. I think what I’m talking about is what the Lutheran philosopher and theologian, Paul Tillich, meant by being grasped by ultimate concern. He says this about religion: Religion is the state of being grasped by an ultimate concern, a concern which qualifies all other concerns as preliminary and which itself contains the answer to the question of a meaning of our life. The ultimate concern he is talking about, of course, is God; and perhaps it’s just another way of saying what the oft-quoted St. Augustine once said: Thou hast made us for thyself, O Lord, and our heart is restless until it finds its rest in thee. On Wednesday of this week, the Feast of the young Passionist, St. Gabriel of Our Lady of Sorrows, we took possession in St. Mungo’s, just for a week, of a very special icon of the Passion of Christ. This icon was unveiled at our Passionist General Chapter last October, and is now on a journey around all the churches and communities in the Passionist world, over 60 countries on every continent, to help prepare us for the 300th anniversary of the Passionist Congregation which was founded by St. Paul of the Cross in 1720. The icon has 3 panels. The centre panel shows the Crucified Christ and, on either side of Christ’s cross, stand Mary, Mother of Sorrows, Patroness of the Passionist Congregation, and St. Paul of the Cross, Founder of the Passionists. The side panels show four figures representing four aspects of the Passionist Vocation. There is St Gemma Galgani, who represents the Passionist laity; St. Gabriel Possenti who represents Passionist students; Blessed Isidore de Loor who represents the vocation of the Passionist Brother, and Blessed Dominic Barberi who represents the Passionist missionary vocation. Blessed Dominic was a missionary to England and is best known for receiving Blessed John Henry Newman into the Catholic Church, and I have always been very taken by what each of them had to say about each other in that very famous incident. Blessed Dominic said “The door opened and what a spectacle it was for me to see, at my feet, John Henry Newman, begging me to hear his confession and to admit him into the bosom of the Catholic Church.” Blessed John Henry Newman said of Dominic: “When his form came within sight, I was moved to the depths in the strangest way. The gaiety and affability of his manner, in the midst of his sanctity, was itself a holy sermon.” The icon also shows the hand of the Father, and the Holy Spirit in the form of a dove, above the cross, as well as angels bearing the symbols of the Passion, and other angels watching over. It’s very beautiful and rich in colour, as icons always are. Various roles I have had with the Passionists over the years have enabled me to have a little connection with all of these saints. When I studied in Rome, I used my university breaks to visit places connected with St. Paul of the Cross, including the tiny sacristy room at the Church of St. Charles in Castellazo where he made a 40-day retreat in November 1720, during which he wrote the first Passionist Rule, and that’s why our founding is dated from that year. I have visited the font in Assisi where St. Gabriel was baptized, the same font in which St. Francis and St. Clare were baptized, and also his shrine ai Isola where the editor of the St. Gabriel Magazine kindly printed my ordination cards on their magazine presses. A few times I have visited Lucca and all the places connected with St. Gemma, and I have a niece named after her. Blessed Isodore’s shrine is in Kortrijk in Belgium, and when I was novice master for North Europe, I had the chance to go there and see the wonderful devotion the people of that area have to him; and I have often visited the shrine of Blessed Dominic in Sutton, Lancashire, which he shares with another famous Passionist, Father Ignatius Spencer, (ancestor of Princess Di) and Mother Elizabeth Prout, founder of the Sisters of the Cross and Passion. It was a great blessing to get to all these places, as it is a great blessing now to have this icon with us. May the Passion of Our Lord Jesus Christ be ever in our hearts. Amen. I’m a day late getting to my Log this week (I still can’t convince people it’s a log and not a blog, or as one of our elderly members in the Passionist community referred to it – a blob). Still, I will persevere in my technophobia and insist that it’s a log, as in Captain Kirk’s Log from Star Trek. It’s been a really busy week, hence the day late, and the Gospel for today is about Jesus healing a man who is deaf. I remember well sitting around the dinner table at Mount Argus in Dublin a few years back, where a very animated conversation was going on. One of the senior men seated beside me was obviously struggling to keep up with it and he turned to me and said, “it’s a curse to be deaf”, and, despite all the wonderful people who were deaf, and more than compensated for it by doing extraordinary things, for example Beethoven, arguably the greatest composer of all time, and Thomas Edison, inventor of, among many other things, the phonograph and the light bulb, it can be a real curse to be deaf, which I have experienced in a small way through a regular struggle with an excess of ear wax. I was also reminded of an incident back in 1988. After a 3-year stint in St. Mungo’s after ordination, I was asked to go into Formation Ministry, working with aspiring Passionists in the early stages after they joined us. I spent 1986-87 doing a year’s training for this, and then I took up the position of Director of Postulants. In the autumn of 1987, I was involved in the setting up of a programme for postulants from many different religious orders, male and female. It was agreed that this course would take place in Mount Argus. In the inaugural year we were filled to capacity with 40 postulants plus their directors. They were a great bunch and the year went very well. Come the summer, when we were winding up, we decided to have a fun day out, followed by a buffet meal, to celebrate the end of the programme. The fun part of the day brought us to a place called Clara Lara in County Wicklow, very near to the ancient monastic site at Glendalough. At one stage a number of us hired rowing boats to go out on the lake. I was in a boat with a couple of other religious priests and two religious sisters. One other boat was being rowed by religious as well, all directors on the course. All the other boats were full of postulants. Now, just because they were postulants with religious orders, doesn’t mean they were different from any other young students eyeing up an ideal opportunity to get one over on their teachers. All was going peacefully until the postulants in one of the boats decided that they were going to ram into our boat. As their boat came speeding towards us, one of the religious sisters, a very holy nun indeed, fully clad in her habit, panicked, screamed, and opted to jump for shore, which was only a few feet away. As she stood up and put her foot on the side of the boat, the boat toppled over, and we all ended up in the lake. Very quickly we were out of the lake, safe, but soaked to the skin. The rest of the day was fine. We soon dried out and changed, laughed about it, and had a very enjoyable closing celebration. The next day, however, I couldn’t hear a thing. I let it go for a couple of days hoping it would clear up, but the experience was very isolating. On the third day (very biblical) I went to the doctor who reckoned I had picked up an ear infection from the lake water getting into my ears. He prescribed medication, but also sent me for some tests to the ENT department in the local hospital, just to be sure there was nothing more serious, which thankfully there wasn’t. It took a good couple of weeks to clear up completely, and I found being deaf a most unpleasant experience. So, ever since then, anyone with hearing difficulties has had my most sincere and profound sympathies. As I write my log this week, which I usually do on a Thursday, the Gospel for the day is about Jesus sending the 12 disciples out on mission, and he sends them out in pairs. It brought to mind the first time I went out to preach a parish mission, shortly after my ordination as a Passionist priest, and being paired with a much older, more experienced missioner, to provide encouragement and support, and to show me the ropes. This good priest was a missioner in more ways than one. He had spent most of his priestly life as a much-loved missionary in Botswana, before coming home in the late 1970’s, after which he was appointed as assistant to the Novice Master in Crossgar, just as I was entering the Novitiate with my 4 classmates. He was a man of great kindness, humour, experience and wisdom, and we enjoyed his input very much. I do remember, though, when he accompanied us on the Novitiate Holiday to Hook Head in County Wexford, that he got quite annoyed when we were acting the goat during a game of cards. He later apologised and explained that in Botswana, when the missionaries would come in once a week from their various mission stations, to have a meal together, catch up on each other, and enjoy a game of cards, that they took the cards very seriously, and that he still hadn’t got that out of his system. I was delighted, then, when I was paired with him as a young priest, to conduct my first parish mission in Derry City. It was an extraordinary experience as all of the parishes in Derry City held their annual mission at the same time. Of the seven parishes in the city, four of the missions were being conducted by Passionists, and we were in the parish of Our Lady of Lourdes in Steelstown. The parish priest and my mentor, as it turned out, were from the same small village in County Tyrone. At meal times they talked so much to each other that the curate and myself never really got a word in throughout the whole fortnight. Derry City still had the old tradition of a week for the women, followed by a week for the men. On the middle Monday, as the transition took place, it was customary for the parish priests of all the parishes to bring the missioners out for lunch. All the Passionists from the four parish missions were brought to the same place, so it was great to catch up with how everyone was doing. The first Mass each day was at 6 a.m. followed by Confessions. The local bakers would set up stalls with hot morning baps to sell after Masses. The last priest out after Confessions was always given a free bag of hot baps to bring back for breakfast. An extraordinary tradition was that, on the final night of the men’s mission, all the men, young and old, would wear a white flower in their lapel, given to them by a woman in their life – wife; mother; girlfriend; sister, or whoever it might be – to signify the state of grace they were now in at the end of the mission, and no doubt hoping that they might stay that way, at least for a while. What a sight to see a packed church of men wearing flowers! I gave many parish missions after that, both in Ireland and in Scotland, and I enjoyed all of them, but that first mission was quite unique, and an experience I will never forget. I don’t know if Derry City has continued those wonderful traditions, and I suppose parish missions are few and far between now, but I will always feel blessed and grateful for the good people of God I met in many places, for their faith and their kindness, and for the encouragement they gave to me and to whatever companions I was with. My companion and mentor on that particular mission has gone to God now, as has the parish priest. I imagine they are still sharing memories of that little County Tyrone village that they both came from, and I doubt whether even God will manage to get a word in. really good people who were much loved, and who were deeply rooted in family and faith. Despite the sadness of such occasions, there was also a great sense of hope and joy as well, given the good memories and the legacy of love left behind by each of them. Neither funeral had a reception of remains the night before, and that seems to be a growing trend, the families preferring to arrive at the church just before the beginning of the Requiem Mass, and to have the prayers of reception then. So, just as cremation would now be much more prevalent than burial, even for Catholic funerals, this way of doing things is becoming more prevalent too, and that’s absolutely fine, although the choice for either absolutely remains in the family’s hands. Each family will know what helps them most. Then, in the middle of the week, I was sent the funeral arrangements for the retired Bishop of Gabarone in Botswana, who had died the previous Friday at the age of 91. These funeral arrangements were being communicated to all the Passionists in Scotland and Ireland as Passionists from our Province had laboured in Botswana from the early 1950’s, and all had worked very closely with Bishop Boniface and come to know him as a true friend, and a very good, gentle, kindly and holy pastor, ever since he took over as bishop after the death of the Passionist, Bishop Urban Murphy CP, in 1981. Indeed, Bishop Boniface was a Passionist at heart, and would dearly have loved to have been a Passionist, but at the time when he pursued his vocation to the priesthood, the Passionists were focussed on building up the church in Botswana and didn’t have the structures to receive Passionist vocations, and instead channelled any enquiries towards the diocese, very much their gain and our loss. Some people here in St. Mungo’s, and those around our other houses in Scotland and Ireland, might possibly have met him, as he used to come over from time to time in order to thank people for supporting our missions, and to visit the families of Passionists from Scotland and Ireland who had worked, or who were still working in Africa. When he visited, he was never interested in sightseeing or going to places of interest, he was only interested in meeting people, people to whom he felt a deep sense of gratitude for their generosity in the giving of their resources, or in the giving of their family members, to help his country grow in faith. I had met him a few times before I went out to work in Botswana for a short time myself in 1993-94, and he could not have been more helpful or supportive, so, I have a tiny sense of how much he was loved, and how much he will be missed, by all the people of Botswana. Of course, Fr. Lawrence in St. Mungo’s would have known him much better, having spent many years there in various locations, and he regrets not being able to travel and be present for the ceremonies to mark his passing. When I received the arrangements, I realised that anyone of us would need to be in the fulness of our health to endure them. Bishop Boniface’s remains would lie in state in Gabarone Cathedral from 10 0’clock on Thursday morning until 6 o’clock on Friday morning, to allow people to view his body and pay their last respects, which they would do in their droves. During that time there would be a Requiem Mass at 7 p.m. led by bishops. At midnight there would be another Mass led by diocesan priests. At 4 o’clock in the morning there would be yet another Mass led by the Religious. At 6 o’clock in the morning Bishop Boniface’s body would be transferred to the National Stadium, as the Cathedral would be far too small, for a final Requiem Mass at 10 a.m., before being brought back to the Cathedral for burial beside Bishop Boniface. And then the feasting would begin. I feel exhausted just thinking about that, but the good people of Botswana, who loved their bishop dearly, would not, I’m sure, bat an eyelid at being there from beginning to end. My thoughts and prayers are with them in their great loss, and in their treasured memories. I am writing this log on the day that Pope Francis arrives in Panama for the World Youth Day celebration which is taking place under the theme: I am the servant of the Lord; May it be done to me according to Your Word (Lk 1:38). As there was no group going out this year from Scotland, Brother Antony tried to bring a touch of Panama to St. Mungo’s last Wednesday night by exploring that theme with the Passionist Young Team, and by sharing some of his own experiences of World Youth Day’s over the years. St. Mungo’s, of course, has had a good history of sending groups to World Youth Days, and a number of people now involved in various ministries have experienced those wonderful events when they were a bit younger. It’s an amazing experience for a young person from Scotland to meet so many young people from all over the world, so alive, and so enthusiastic about their faith, and to realize that they are not weird just because they believe in, and practice their Catholic Faith. My own experience is quite limited. I regularly sent a group of young people from Mount Argus in Dublin, but I was never able to free myself up to accompany them. I had great intentions of going to Australia in 2008 until my niece chose to get married during the same period, and I would have been disowned by the family if I hadn’t been home to celebrate the wedding. She had chosen to get married at St. Simon’s in Partick, a church we all loved, and the church, of course, where her dad had grown up and served on the altar. When I turned up on the day to do the wedding, I discovered that the church was double-booked and that a Polish Mass was also scheduled to take place. I spoke to the Polish priest and he assured me it would be a short Mass, but it would seem he had a different understanding of what “short” meant than I had. Still, there was no panic, and while the groom was kept calm by his groomsmen, and the bride took her time getting ready, adding gladly to her privilege of being late, we eventually got started, and we were still at the reception in good time for the meal. I did manage to get to WYD in Madrid in 2011. Father Paul Francis and I had agreed that our two groups from Glasgow and Dublin would meet up and attend the event together. The two of us went out a few months beforehand to make some arrangements and we stayed with the Passionists at the Shrine of St. Gemma in Madrid. St. Gemma’s Shrine was walking distance from the Bernabeu Stadium, home to Real Madrid, and most of the community were fanatical Real Madrid fans. They took me one night to visit the stadium, to have a bite to eat in the restaurant, and to have a personal tour, as they were all well known to the staff. I was able to impress them with the knowledge that in 1960, 127,000 people attended the European Cup Final between Real Madrid and Eintracht Frankfurt at Hampden Park, in Glasgow, which at that time was the biggest football stadium in the world. At the World Youth Day itself, a few months later, we endured 40 degrees of heat for days, with little shade to be found. Even on the long trek to the venue for the overnight vigil and the final Mass with Pope Benedict the following morning, which would be attended by an estimated one and a half million people, kindly residents were hosing us down with water as we walked along, to cool us in the scorching heat. But then, just as a period of Adoration of the Blessed Sacrament was about to begin, a ferocious storm brewed up, scattering tents and sleeping bags everywhere, and even endangering the Blessed Sacrament Tent, leading to that prayer time with the pope being abandoned. Eventually, the storm calmed, and we bedded down for the night. In the morning we were able to celebrate the Eucharist with Pope Benedict as planned, and then wend our weary way home. It was a wonderful experience for the two weeks we were together with our young people from Glasgow and Dublin, and from all over the world, firstly in Valencia for some preliminary events, and then in Madrid. But I decided there and then that, having turned 60 a couple of months before, this would be the last time I would ever sleep in a field, and that is one of the few resolutions I have ever kept. This week we celebrated the feast of St. Mungo and it got me thinking about nicknames. The Gospel for the feast was the call of Simon in which Jesus confers on him the nickname Peter, which means rock, because Simon Peter will be the rock on which Christ will build his church. And while the choice of that Gospel probably has more to do with the waterside, with Simon’s call taking place by the sea of Galilee, bringing to mind Mungo’s ministry by the River Clyde, close the Molendinar Burn, still and all we know that Mungo was also a nickname, meaning the dear one, or the dear one of God, given to the young boy Kentigern by the monk Serf who helped take care of his mother, Thenew, whom we know better as Enoch, as in St. Enoch’s Square. The people who gathered around Mungo by the River Clyde were also given a nickname, the ‘Clasgu’, meaning the dear family (of God), and of course when the growth of people eventually became a city, the city was given the name ‘Glasgu’ (Glasgow) meaning the dear green place. I’m sure proper historians will have much to correct in that account, but I think I have at least the poetic gist of it. I didn’t really have a nickname growing up, except that I was always referred to in the family as Wee Frank, but this was to distinguish me from my father, who was 6 foot, four inches tall, and therefore Big Frank; and, also, from my uncle Francie and my cousin Frankie. The only person who ever called me Francis was the Provincial of the Passionists at the time I entered; and there was another priest who could never remember my name, or any other student’s name for that matter, and he just called me Scotty, because at least he could remember what country I came from. When I was based in St. Mungo’s for my first three years after ordination, one of the Community used to make fun of how I tried to be so well prepared for anything I did, and he gave me the nickname Preparation F, after a certain ointment called Preparation H, which he apparently used quite regularly. I’m sure many of you will know what that particular ointment is used for, so it wasn’t the most flattering of nicknames. Some of the saints had good nicknames. Saint Francis of Assisi for example was called God’s Troubadour because, on his itinerant preaching journeys, he was forever singing like a travelling minstrel to express his sheer joy at the beauty and the wonder of God’s creation, that he saw and delighted in every day. The Passionist, Saint Gabriel of Our Lady of Sorrows, who was also born in Assisi some 600 years after Francis, and who died the day before his 24th birthday, is one of the patron saints of young people; but he was once nicknamed The Dancer, because of the great social life he enjoyed before pursuing his vocation in Religious Life. One of the early Church Fathers, Saint John Chrysostom, the 4th century Archbishop of Constantinople, was nicknamed Goldenmouth because of the eloquence of his preaching and public speaking. There is also, of course, Saint Therese of Lisieux, the 19th century Carmelite mystic who, despite sickness, doubts and fears, strove to live each day with an unshakeable confidence in God’s love. Therese loved flowers and saw herself as the little flower of Jesus, who gave glory to God by just being her beautiful little self among all the other flowers in God's garden. Because of this she is forever known by the nickname The Little Flower. In these days we are celebrating the Week of Prayer for Christian Unity, ending next Friday with the feast of the Conversion of St. Paul. In his earlier years, when he was called Saul, he was nicknamed Saul the Persecutor, because of his determination to destroy the fledgling Church of Christ. Later, after his conversion, and while on the Island of Cyprus, he begins to be called Paul, meaning Small, which some take to be a sign of growing humility, seeing himself as the least of all the Apostles. At the end he is nicknamed the Apostle to the Gentiles, striving to bring Christ’s Gospel to every tribe and tongue and people and nation. That they may all be One, Father, as You are in Me, and I am in You; may they also be in Us. Welcome back to the log after a short break for the festive period. I hope this coming year will be a very happy and blessed one for all of you. All the liturgical celebrations in Saint Mungo’s went as prepared, and were well attended, but not everything went according to plan. On Christmas Eve I wanted to get around the parish sick and housebound and bring them Holy Communion to celebrate the Nativity of the Lord. Our parish secretary phoned around to let them know I was coming and received an answer from all but one. All who answered said they would be grateful for the visit and delighted to receive the Holy Eucharist. When I got to the end of my visits, which I thoroughly enjoyed, I decided I would try again to phone the person who hadn’t answered the first time, just in case they were now available. Again, there was no answer but, just as I was heading back to the Church, I received a call from them, and was told that a visit and Holy Communion would be most welcome. I made my way back to the high-rise and punched in the code for the floor and flat number. Surprisingly, there was no reply. I tried again, still no reply. I couldn’t understand as I had just spoken to the person on the phone. Someone else came along and I thought they might let me into the block, but they got no reply from the person they were hoping to visit either. I decided to phone the person again and they answered. They told me to punch in the code which I had already done twice, but I tried again, and this time I heard someone at the intercom, clearly not very happy, and, when they asked who I was, they said they had never heard of me. I was baffled. Just then someone came out and I took the opportunity to enter the block and head up to the relevant floor. When I got to the flat it was secured like Fort Knox, and suddenly it occurred to me - I was at the wrong high-rise! I should have been at the next one along. When I eventually got there, I had to apologise for being so stupid. On Christmas Day, when all the Masses were over, I went back to the house for a rest. Later on, the Passionist Community in Bishopbriggs sat down together for a traditional Christmas dinner, prepared by Brother Antony. I went easy on the dessert as, after the meal, I was heading to my niece’s house for a family gathering. I was timing it to arrive for after their main meal, but in time for dessert. When I got there, I discovered that things were running a bit late as, earlier on in the day, a burning candle had set fire to a side-table and created a period of panic. By the time I got there however, everything was calm, except for a crazy game of Family Fortunes that was in progress. Only after that was dessert time declared. Everyone was looking forward to this as my sister-in-law’s sister makes the most wonderful desserts and, even though I had eaten, I managed to find space for a very sizeable portion of two of them. I was already looking forward to our traditional family Hogmanay bash at my other niece’s house, when the same lady would produce even more mouth-watering desserts. There have been lots of recent campaigns encouraging people to donate blood and, as I write, Brother Antony and I are getting ready to celebrate our final Mass of the year at Glasgow Caledonian University, after which he hopes to dander down to Nelson Mandela Place and give blood for the 19th time, according to the form he received, although he had thought it was more. I, myself, used to regularly donate blood, but all that came to a halt back in 1985. I was based in St. Mungo’s at the time, not too long after my ordination, and I had been invited by the Passionist Contemplative Nuns in Daventry, 80 miles northwest of London, to come down and give them an Advent Retreat. I was very happy to do this and looked forward to it as, at that time, there were a number of young nuns in the community who had joined through a Passion Prayer group that Father Paul Francis and I used to hold in St. Mungo’s, which was in fact a development from the Jesus Evening prayer group that Father Terence, my predecessor as Vocations Director, used to run. The Passionist Nuns in Daventry tried to be self-sufficient in different ways, including bookbinding and carpentry but, more controversially, they kept battery hens and sold the eggs. They were always being “visited” by animal rights groups and, in time, they abandoned this occupation and took up the more acceptable, but not as lucrative occupation, of making Belgian chocolates instead – two of the nuns were Belgian and had a secret recipe. The ethics of keeping hens in battery cages was settled when an EU ban came into force some years ago, although I believe the practice still goes on, but this was well before that. The nuns kept two huts with roughly 10,000 egg-laying hens in each hut, and while I was there conducting the retreat one of the huts was being cleared and cleaned out to make way for a new batch of hens. A distinctive and unpleasant smell hung in the air that I felt I was breathing in the whole time. The retreat finished and, much as I had enjoyed it, and the nuns treated me very well, I was glad to get back to Glasgow and to St. Mungo’s for Christmas. Very soon after my return I began to get carbuncles appearing on various parts of my body, most especially under my armpits and on the back of my neck. No sooner would one clear up than another would appear, and I felt totally drained, and permanently exhausted. Medication didn’t seem to help and eventually I was admitted to the Royal Infirmary to get a carbuncle removed from the back of my neck, and for a swab to be taken for analysis. The legendary Father Ambrose was chaplain at the time and I remember him giving me the Sacrament of the Sick the night before surgery. I went down to theatre next morning and the next thing I remember was waking up out of the anaesthetic with a lovely floating and peaceful feeling, and the realisation that it was all over. It was the weekend, and so I was let home to the Retreat and ordered to rest. The Rector kindly allowed a television to be put into my room and I remember on the Sunday night, 28th April 1985, lying awake watching Dennis Taylor beat Steve Davis on a re-potted black in the last of 35 frames, in an extraordinary and famous World Snooker Championship Final from the Crucible in Sheffield, which at 14 hours and 50 minutes, over two days, remains the longest final ever played. I watched it all from my bed. The swab revealed a blood infection that was treatable by applying a tincture deep into my nostrils when I would feel my nose starting to swell, which apparently was the source, and the first sign of a carbuncle on the way. After a while the whole thing cleared up and, thankfully, it hasn’t returned since, but I was never allowed to donate blood after that. Now, I may be doing those poor hens a terrible disservice, but I have always considered them to be the cause of my lengthy, painful ailment, and of bringing to an end my blood-donor days. The log will take a wee break now for the next few weeks, so let me wish you all a very happy and holy Christmas, with every blessing for the coming year. This weekend in St. Mungo’s we are happily celebrating a Thanksgiving Mass for the Golden Jubilee of Passionist priesthood, of two men who have played a big part in my own journey as a Passionist down the years; Father Jim Sweeney CP, and Father Bernard Lowe CP. 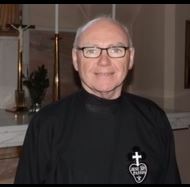 In 2016 at our Provincial Chapter, Father Jim became the first Scot ever to be elected Provincial of the Passionists of St. Patrick’s Province, which is made up of a number of houses in Scotland and Ireland, as well as an English-speaking parish in Paris. Until recently St. Patrick’s Province also included South Africa, Botswana and Zambia, and while restructuring has seen our African Passionists move in the direction of autonomy, our Province still retains a close relationship with them to help and support them on that journey. My first experience of Father Jim was during my working years. In 1969, after leaving St. Mungo’s Secondary School, where Father Jim had just been appointed chaplain, I had started going to the Passionist Retreat House at Coodham in Ayrshire and had become a lay member of the team conducting the retreats. Father Jim had been ordained in December 1968 and, while based in St. Mungo’s, he had also got involved with the Youth and Young Adult Retreats at Coodham. In those exciting times after Vatican II, I always found his inputs and liturgies hugely inspiring, and, without doubt, his inspiration contributed to my decision, made in the summer of 1974, to abandon accountancy and test out a Passionist vocation. Father Jim had also been appointed Vocations Director for the Passionists in Scotland and I remember leaving work in Olivetti one day and getting off the bus at St. Mungo’s to go and make my initial approach. When I got to the Retreat, I discovered that there had been a Provincial Chapter that summer, and that Father Jim had been replaced as Vocations Director by Father Michael Doogan, who had been ordained in December 1970. Those who knew Father Michael will appreciate that I didn’t have a straightforward accompaniment process with him. Always larger than life, Father Michael had me involved in all sorts of things, and it was only after I entered the following year, and heard my classmates talking about their interview experiences, that I realised that I had never actually had an interview. The only thing I remember from that time was a very young and fresh-faced Father Paul Francis, home for a family visit, filling me in on life as a Passionist Postulant and Student. Father Jim was transferred to Coodham after the 1974 Chapter and he continued to be a big influence on me and a great support to me as I prepared to leave for the Graan in Enniskillen, where my postulancy was due to take place, and he has continued to be an inspiration and support down through the years. I was very happy when he was elected Provincial. After 4 years of postulancy and studies I was more than ready to go to the Passionist Novitiate in Crossgar, County Down. It was 1979 and myself and my classmates had waited on in Dublin for the visit of Pope John Paul II to Ireland before heading north. The Novice Master was Father Bernard Lowe, who had prepared for this ministry by spending some time in America. Father Bernard is a very gentle, quiet man; but with a breadth of wisdom and knowledge that is hard to match, and an edge of steel that only comes into play when it has to. I look back on my Novitiate as one of the best and most formative years of my life, as indeed it is meant to be, and a lot of that was down to Father Bernard. In later years when I was also made Novice Master, I had a very good role model to look back on. I also served on the Provincial Council when Father Bernard was the Provincial, and we worked together for a number of years in Mount Argus when he succeeded me as Rector and I continued on as Parish Priest. He is a genuinely good and holy man. I could not do justice to these two good and gifted men in such a few words, but I congratulate them and wish them every blessing. May God’s love and grace be on Father Jim and Father Bernard, in thanks for all they have given of themselves in the service of God these past 50 years as Passionist Priests. Amen. I’ve lost count of the number of storms we have encountered over the past few months, but as Storm Diane raged recently, my thoughts drifted back exactly 36 years to a storm I experienced on a mountaintop in Italy that was the closest thing I have come to feeling I was in the presence of El Shaddai – one of the names given to the God of Israel - usually translated as God Almighty, but which can also be understood as the God of the Mountain. After my final profession of vows as a Passionist in September 1982, I travelled to Rome to study pastoral theology at the Gregorian University before returning to Glasgow for priestly ordination the following June. As a prior step I was to be ordained a transitional deacon in our Passionist Monastery of Saints John and Paul in Rome, in December 1982. Towards the end of November that year I had taken and passed my faculty exams at St. John Lateran and I was to make a retreat in preparation for my diaconate ordination. I knew I would never get an opportunity like this again, so I asked the rector of Saints John and Paul if I could make my retreat in the Passionist monastery on Monte Argentario, the first ever retreat established by St. Paul of the Cross, set on a mountaintop, and named after the Presentation of Our Lady, a feast of Mary that was close to the heart of our founder. I was readily given permission and so, almost immediately after my faculty exams, I made my way to the coast, north-west of Rome, and ascended the mountain to the Retreat. On the fourth day of the retreat, I had been praying and reflecting on the story of Abraham and Isaac, in which Abraham ascends the mountain with his son, thinking that he was to sacrifice his only son to God, only for God to stay his hand at the last minute. The reflection was intended to instil in me a sense that ordination meant putting God and God’s purposes before all else, and making God, in obedience to His word, my ultimate concern. As I stepped out on to the mountain after evening meal that night, into the darkness, an almighty storm was raging, torrential rain, a mighty wind, thunder and lightning – the works. And even though one of my favourite scripture texts, from the 1st Book of the Kings, is where Elijah goes out on the mountain and does not experience God in any of these things, but rather in a gentle breeze, still I felt there was something of the divine presence that night. Further up the mountain there was some kind of electrical power installation that was set in the form of a cross. It was discretely lit up at night, but when, every now and again, there was a flash of lightning, it lit up all the more. It was all very dramatic. I know it sounds mad, and it was mad, but I felt compelled to walk up the mountain towards the cross. I was well wrapped up and the mountain path was good underfoot, although steep and winding, and I had to walk against a mighty wind, Passionist habit flapping against my legs, two steps forward, one step back, but eventually I reached the cross. I stood there for a while thinking of Abraham and Isaac on Mount Moriah; Moses ascending Mount Sinai to receive the 10 commandments; Elijah experiencing God in the gentle breeze, also on Mount Sinai; Jesus transfigured on Mount Tabor; Jesus carrying his cross up Mount Calvary to be Crucified, and finally the Ascension of Jesus from Mount Olivet. Like the disciples coming down from Tabor, I eventually, and a little reluctantly, descended into ordinary life, which is where God must be encountered most of all, but I knew I had experienced something I would never forget, something, the power of which, seems to touch me again and again, whenever there is a storm, or whenever I ascend a mountain to pray. Apologies that I never managed to write the log last week. There has been a lot of to-ing and fro-ing to Ireland recently for meetings as I carry a few different roles in our Passionist Province of St. Patrick, as well as being rector and parish priest of St. Mungo’s. That put a fair bit of extra pressure on me; but mostly I am missing Father Gareth who has been at home in Merthyr Tydfil for the past 5 weeks giving support to his mum who is ill at this time. I miss his unique presence, his good humour, his generous spirit, and his appetite for working hard and easing my load. Having said that, he is absolutely where he needs to be at this time, and he and his mum are constantly in our prayers. Obviously, there is a mountain of good will towards him around St. Mungo’s, and the two phrases I keep hearing from people again and again are: your mother is your mother; or, you only have one mum. True enough! That got me to thinking about my own mum, whom we always referred to as mammy. She was a great woman, despite being under 5 feet tall, who, having been left widowed at an early age with three young sons, worked herself tirelessly to raise us and care for us. Her main job for many years was as a barmaid in the Downhill Bar in Partick, where we were born and grew up. She was very well known and liked among the regular patrons. I got a good sense of that myself when I worked behind the bar during my summer breaks home as a Passionist student. I also discovered how hard the work was. On top of that she took on cleaning jobs in some of the big houses around Downhill, Kelvinside and Hyndland; and she did some school cleaning as well. Her weekly game of Bingo was one of her rare breaks and enjoyments. One thing I often neglect to recall about her, however, is that she was considered to be a lovely singer. My uncle Tony, who was really granny’s brother, and therefore mammy’s uncle, was renowned as a bit of an impresario around Partick, and the concerts he put on in the Partick Burgh Hall and other places attracted well-known entertainment figures and big audiences; and very often mammy was one of the support acts. It was a gift she passed on to her three sons, as every one of us is capable of holding a tune. Patrick is a bit shy about singing, but has a lovely voice, but not so shy at times at being a mimic, with an extraordinary memory for funny one-liners from the classic comedians; give Hugh the floor and Frank Sinatra comes to life again; but I suppose I was the one who developed it a bit more than the others, singing and playing double bass in a couple of folk bands before entering religious life, and later becoming involved in contemporary liturgical music. Be filled with the Spirit, singing psalms and hymns and spiritual songs among yourselves, and making music to the Lord in your hearts. I’m late getting to the Log this week as I have been in Mount Argus again for meetings. I only returned on Friday and was glad of the company on the return flight of two friends from Dublin who were coming to Glasgow for the weekend to attend a Christmas Craft Fair in the SECC. As we were making our way to the departure gate, we passed what was obviously a hen party, coming off the Glasgow plane and heading to Dublin for a wild weekend, and we agreed that we were glad they weren’t travelling in the opposite direction. When we got to the gate, however, we discovered that there was a stag party heading from Dublin to Glasgow for an equally wild weekend. One of the differences we noted between the hen party and the stag party was that, while the women had taken the bother to dress up with rabbits’ ears, and glitter, and T-shirts with all kinds of slogans on them, the men just wanted to get down to the serious business of drinking themselves silly. Boarding the plane was a bit chaotic as the stag party didn’t seem to have paid much attention to what seat they were in, or whether they were to board from the front steps or the back steps. I had to greatly admire the patience of the cabin crew and eventually they got everyone settled down. Once we were in the air, and as soon as the fasten seat belts sign was switched off, some of the group were delegated to descend on the cabin crew to more or less clear the trolley of small bottles of spirits, as obviously waiting for the trolley to come up the aisle would have taken too long and reduced drinking time. It seemed as if we were hardly up in the air before the fasten seat belt sign was switched on again for landing, which meant of course that the toilets were now out of bounds; however, that didn’t prevent the stags from trying to get to the toilet, only to be gently turned back by the ever-patient crew. To be fair, nobody really caused any bother and, apart from being boisterous and noisy, there was never any fear of trouble. As we got off the plane my two friends and myself expressed the hope that the stag party wouldn’t be on the same bus as us going into Glasgow. We needn’t have worried, however, as once we were through security and into the terminal, they headed straight for the bar. I hope the hens and the stags enjoy their respective weekends in Dublin and Glasgow, but I wouldn’t want to be them on Monday morning trying to get up for work. Back in St. Mungo’s today, scaffolding has arrived and work has begun on changing all the light bulbs in the church, which is a major task. Over the past while a significant number of the lamps had gone out and the church had become quite dim. A surprising number of people said that they really liked the atmosphere this created and found it prayerful, relaxing and reflective, a bit like praying or celebrating Mass in the catacombs. Still, we had no choice but to change them before it got too dark altogether. It had once been a task that our own maintenance people could carry out on a staggered basis, but due to new health and safety regulations this is no longer possible and so we had to go down the more complex, and costly route of engaging contractors. No doubt it will all be worth it when the task is complete. The biggest difficulty, of course, is the great height that is involved, and I was reminded of one of our volunteers at Mount Argus in Dublin who frequently used to scare me to death by his total lack of fear of heights. At times like Christmas and Easter he was determined to create atmosphere in the church by placing candles around a ledge at the top of the sanctuary, and he would do this by simply using an extended step ladder. I could never convince him not to do it and I always had to leave the church as I couldn’t even bear to look at him. The effect was beautiful, but then he would undertake the task of taking them all down again. He was a great guy, but I had to admit to a certain relief when he married and moved away and surrendered his role in the parish, only to discover that his father was just as fearless as he was. Health and safety regulations may go over the top at times, but they can be useful too. He will raise you up on Eagles Wings… (based on Psalm 91) – that’s how to fly and go high. I’m writing my log this week on the Feast of St. Willibrord (658-739 AD). Willibrord was a missionary from Northumbria, known as the Apostle to the Frisians, in what today would be the Netherlands. He later became the first Bishop of Utrecht. My interest in Willibrord goes back to when I was living in the Passionist Monastery at Minsteracres in Northumberland, which I imagine corresponds to part of Northumbria back in the day. At that time, I was the novice master for the Passionists of North Europe and on visits to our Dutch Province, the Province of Mary, Mother of Holy Hope, I would always meet people who spoke with great love and affection for Willibrord who brought the faith to them back in the 7th/8th century. Willibrord became the first bishop of Utrecht and that sparked off an extraordinary memory from a time I was visiting the Dutch Passionists in their mother house at a place called Haastrecht, about 25 miles from Utrecht, which is a really beautiful city. While I was there the community hosted a meal, and among the guests was an Irish girl who played the viola in an orchestra based in Utrecht. She was placed beside me so that we could chat away in English as my Dutch was non-existent. Almost immediately she asked me if I knew an Irish Passionist called Father Herman, which of course I did, God rest him. Father Herman was a lovely, but rather eccentric man, a poet and a musician, who was very much involved in the Legion of Mary. He had been a great friend and confidante of Frank Duff, the founder of the Legion of Mary, and he inherited Frank Duff’s bicycle when he died, keeping it suspended from the ceiling of his small cell in Mount Argus monastery. Herman himself loved to go cycling, especially to Glendalough, site of the monastic settlement in County Wicklow founded by St. Kevin in the 6th century. Sometimes he would go there and forget that he was due back to celebrate the evening Mass. When I was rector and parish priest at Mount Argus, he could at times frustrate and infuriate me because of his unpredictability, but I could never stay angry with him because I liked him so much, and he was always willing to help out if I was under pressure – so long as he remembered. Glendalough was the location for this story told to me by the Irish viola player. She was off somewhere with the orchestra when her father died and, for whatever reason, the family were unable to get in contact with her. Funerals happen quickly in Ireland and so, by the time she found out, he father was already buried. She went home, and one day she was walking in Glendalough, where her father had often walked. She was thinking about him and feeling sad when she came across Father Herman pushing his bicycle up a steep hill. She had never met Father Herman before, but they got talking and she told him about her father and about missing the funeral. Herman asked her if her father was also a musician, which he was. Father Herman then told her that he had known her father, and had once written a poem about him, which he happened to have in his jacket pocket at the time. He then reached into his pocket, produced the poem, and gave it to her to keep. She was overwhelmed, shed floods of tears, and shed them anew as she told the story to me, and never forgot Herman ever after. As I always say, there is no such thing as coincidence in the life of faith, only providence. O Lord our God, you call whom you will and send them where you choose: We thank you for sending your servant Willibrord to be an apostle to the Low Countries, to turn them from the worship of idols to serve you, the living God; and we entreat you to preserve us from the temptation to exchange the perfect freedom of your service for servitude to false gods and to idols of our own devising; through Jesus Christ our Lord, who lives and reigns with you and the Holy Spirit, one God, for ever and ever. Amen. Last Saturday our Passionist Young Team hosted a Quiz Night to raise funds for the Apostleship of the Sea, and also to put some funds aside for themselves to help pay for Day Retreats and nights out etc. Fancy Dress was essential and, if you were to walk around the tables, you would have found sailors; Arab sheiks; princesses; goths; cowboys; politicians; rock- stars; monsters; super-heroes; witches, and a blood-soaked surgeon with a saw sticking out of her head, to name but a few. If there were a prize it might have gone to Shrek and Princess Fiona, who really looked the part. I have to confess I hadn’t intended dressing up, but Father Gareth had bought a few bits and pieces and then was unable to be there as he has gone home to Merthyr Tydfil to be with his mum who is quite ill at this time – prayers please. I knew that everybody was going to miss him so in his honour I put on his costume which, I think, was meant to be a pirate. I had a three-cornered hat; a stripey-jumper; an eye patch with a skull-and-crossbones on it; a telescope, and a false beard and moustache which wouldn’t stay on. It was an effort anyway. It had also been intended that Father Gareth be the quiz-master, so Brother Antony stepped into that breach. He also excelled in fancy-dress and might have given Shrek and Fiona a run for their money. He was covered in black from head to toe and every now and again, in between quiz rounds, he would change his mask. He started off as the grim reaper; then the Scream; and finally, a skeleton skull, before returning to the grim reaper. I think he may have had in mind the Danse Macabre (Dance of Death) which he had been discussing earlier with the young team in relation to Halloween. The Danse Macabre was originally inspired by the horrors of the middle ages, especially the Black Death. It is an artistic personification of death containing representatives from all walks of life dancing along to the grave, usually with a pope, an emperor, a king, a child, and a labourer. reminding people of the fragility of life and that death is no respecter of persons, it comes to everyone from all walks of life. I was reminded of a road trip I took with Father Paul Francis over twenty years ago. With him as guide (Fr. Paul Francis didn’t drive at the time) I drove from Paris, where he was then based, down through the Burgundy region of France, where we visited a few Cistercian Abbeys, beginning with Citeaux, and also the occasional winery. We then made our way through Switzerland and over the Great St. Bernard Pass, stopping off at the monastery where they breed the St. Bernard dogs, and down into Aosta in Italy. I was recently asked by Father Gareth to share some of my faith story with our young adult group who meet at St. Mungo’s every Wednesday night. One of the things I was recalling was my experience of being an altar server when the Mass was in Latin and the server had a few more things to do than servers nowadays. I started on the altar when I was 5. I don’t remember everything about it, but I remember some things. We had to learn to recite the Mass in Latin of course, and answer all the responses for the priest. We wouldn’t have had a clue as to what we were saying, except that he altar servers’ cards (and also the people’s missals for those who had them) had the pages divided into two columns, with the Latin down the left-hand side, and the English translation down the right-hand side. It was a language of mystery, beautifully sounding off the tongue. There were lots of moves to learn, like transferring the missal from one side of the altar to the other, or more properly from the ‘epistle’ side to the ‘gospel’ side. At Holy Communion we had to walk with the priest along the line of Communicants kneeling at the altar rails, holding the Communion plate beneath their chin in case a Sacred Host should fall. Some things are not so different from now. For example, pouring water over the presider’s hands at the Offertory, after the bread and wine have been offered. There were three priests in our parish of St. Simon’s in Partick, but I remember in particular the parish priest who, when I would be pouring the water over his fingers, which were held in a very precise and particular way, would raise his hands very suddenly and jerkily when I had poured enough water. The first time he did this, when I was new to it, the water cruet flew into the air and smashed on the floor. After that I was always ready for him. The ringing of the bells at strategic moments is much the same, but perhaps there were more bells back then. As well as the Sunday Masses, I would often serve the early morning Weekday Masses before going to school. On these occasions I would often spend the night at my grannies who lived right across from the church. If we served at weddings and were given something by the couple, we would hand it in and it would be pooled together for the annual altar servers’ outing to the circus and carnival at the Kelvin Hall after Christmas. If we served at funerals we went to the cemetery with the priest to hold the book and the holy water. If it was a weekday funeral we had no problem getting let out of class at school to serve. We would also serve at Devotions and Benediction, usually on a Wednesday night. If the young curate was the celebrant, and there was a midweek match at Celtic Park, he would hustle us into the car after the service and get us into the second half for free. Of course, he wouldn’t be able to do that now, but back then it was just magic. On a Friday night we would serve at the Stations of the Cross, processing around the 14 stations with the priest, bearing cross and candles. This was just the rhythm of life for a young Catholic boy, it was the very air that we breathed, and I loved it. With the Feast of All saints coming up I also remember that, on Holydays of Obligation, we would be let out of class early before the other pupils in school, so as to practice serving for the Holyday Mass, to which the school would be brought; and of course, on the Feast of All Souls, we would have to serve three Masses for the same priest, one after the other, because the priest had the privilege of offering three Masses on that day. The priest still has that privilege today, but whereas now it’s not often followed, back then it was the norm and, if you weren’t careful, you might get “caught” by another priest before you left the church and be asked to serve his three Masses as well. Much as I love the Mass, six in a row was a bit much. In case you don’t know the rule, priests are generally not supposed to offer more than one Mass on a weekday and two Masses on a Sunday, with there being the possibility of offering a second on weekdays and a third on Sundays under certain conditions, such as the shortage of priests. Oh Jesus, my King and Lord, by the grace of the heavenly Father and the power of the Holy Spirit, guide me in all righteousness as I serve You today at the Altar, so I may be always worthy of Your presence. If I happen to make an error, may it be a lesson, so my service will be perfect tomorrow. Jesus, I love you with all my heart. Amen. Last Tuesday I attended the Annual General Meeting of the Conference of Religious in Scotland. It took place, for the first time, in Carfin, and I was looking forward to it as I hadn’t been to Carfin since I was at school, over 50 years ago. I had decided to go by train as there was no direct bus, and recent excursions to Lanarkshire by car had gotten very confusing. I got the bus from Bishopbriggs into Buchanan Bus Station and walked down to Glasgow Central intending to get the 09.17 to Edinburgh Waverley, stopping at Carfin. This would get me there way too early and the next train would have sufficed, but I wanted to give myself time to have a walk around the Grotto area. I purchased my ticket and waited patiently for the departures board to tell me what platform to go to. Eventually Platform 5 came up, with the additional information that we were to head for the front two carriages. Off I went and boarded the train on the first carriage, then settled down to say my Morning Office. Just as I was finishing there was an announcement that this was the train to Newton. What? How did that happen? I grabbed my bits and pieces and jumped off the train, looking to find a guard, only to notice that since I had boarded this train, another train had come in front of us, and that was the train I was meant to be on. I ran along the platform and jumped on to the second carriage from the front, just seconds before the doors closed and the train pulled out. Four stops later I alighted at Carfin. It was a pleasant day and I set off on my stroll. I can’t even say that it had changed a lot since I was last there as I had very little memory of my school trip, but it was obvious that there were some fairly recent additions. One that struck me was a beautiful sculpture of Pope St. John Paul II in the shrine area erected by the Polish Community. It captured that iconic image of JPII as an old and frail man, leaning on his crozier, chasuble blowing in the wind, and giving witness to the dignity of age and sickness. He is gazing over at the glass-fronted chapel of Our Lady, Maid of the Seas, where the Blessed Sacrament is often exposed, capturing his great devotion to Our Lady and to the Eucharist. This chapel is also dedicated to the victims of the Lockerbie Disaster. Lest the Lithuanians feel left out, I was also taken by their shrine area with the Wayside Crucifix flanked by statues of Our Lady of Vilnius, erected to mark the Marian Year of 1989, and St. Casimir, erected in 1990 to mark Lithuania’s regained independence from the Soviet Union. This area is next to the Assisi Garden with statues of St. Francis and St. Anthony, (also St. Claire), and having been Christened Francis Anthony I am a bit of a closet Franciscan. This was appropriate as Franciscans were the first to feature in the main talk of the day which, to mark the centenary of the Catholic Education Act of 1918, was a celebration of the contribution of Religious to Education in Scotland. The speaker was Dr Francis O’Hagan who set out to highlight five Religious Orders in particular whose work had paved the way for that Act. The first of these was the Franciscans of the Immaculate Conception who came to Glasgow 1n 1847 and through whom Catholic religious life returned to the West of Scotland for the first time since the Reformation. Other orders highlighted were the Sisters of Mercy, the Marist Brothers, the Jesuits and the Sisters of Notre Dame. There were some extraordinary women and men among those groups and what they achieved was remarkable. The 4th of October was the Feast of St. Francis of Assisi, my own name saint. In the Passionists, as I am sure is the case in most religious orders, there is a tradition of celebrating the Rector’s feast day as a Gaudeamus – a day of joy, which usually means a decent meal and maybe a glass of wine. Older members of the community recall that in the past it meant two pittances, in other words two desserts. Historically, a pittance was a pious bequest to a religious house to provide extra food and wine at particular festivals, or on the anniversary of the benefactor's death, but over time it had come to mean a simple treat, such as a dessert, over and above the usual fayre. Normally, there was a pittance only on Thursdays and Sundays, but on special occasions there would be two pittances, a rare treat indeed. As the 4th of October approached, and me being the Rector of St. Mungo’s, I was teasing the community as to what they were going to do for the Rector’s feast. There was a football match on television that night, beginning at 6pm, so we agreed that we would have a meal that we could bring into the sitting room and eat while watching the match together. That morning I celebrated the 10 o’clock Mass. Father Gareth was on duty and so I busied myself in the office until lunch time, after which I decided to give myself the afternoon off and go home for a rest. Brother Antony had the car and the plan was that, on the way home, we would do shopping for the meal, a simple pasta, and get petrol in the car which was beeping loudly at us and flashing a red light to let us know it was thirsty. Brother Antony, our number one cook, would then begin preparing the meal while I relaxed in my room. At first everything went according to plan. We got the shopping and then filled the car with petrol at a self-service pump. The first blip was that the machine did not print out the receipt that I would need for our auditors. As Brother Antony drove me to the supermarket to find an assistant to ask about the receipt he noticed a strange sound and a pull on the car. I got out to find the front passenger side tyre as flat as a pancake. We found somewhere to park and I went in to sort out the receipt for the petrol. When I returned, Brother Antony informed me that the tyre wouldn’t take any air, so we spent the next twenty minutes or more putting on the spare tyre. I say “we”, but I really mean Brother Antony as, amazingly, I have never had to change a tyre in my life and, with a bit of a bad back, I didn’t fancy starting now. We completed the journey home and took the shopping out of the car, but then, instead of me going up to rest, I took the car to get what I presumed would be a new tyre, as the old one looked beyond repair. I was told I would have to wait about 40 minutes before they could look at it, so I left it with them and walked into the village where I spent some time sitting, quietly praying in St. Matthew’s, to a backdrop of nice classical music that was being piped through the sound system. I returned just as they were starting to look at the car. As it turned out I ended up having to get two new tyres and two new springs to balance the wheels as one had snapped. I had to leave the car with them and get the bus home, returning the following afternoon to collect it and departing with my wallet a good bit lighter than when I started. My Gaudeamus hadn’t turned out to be the day of joy that was intended. Brother Antony did produce a lovely meal, with a starter that we ate around the table before bringing our pasta into the sitting room; but then the match turned out to be a disaster as well, with our team producing a poor performance and being on the wrong side of a heavy defeat. I may not have received the stigmata that Francis received, but I did feel as if I had received a few wounds. Stigmata Prayer: Lord Jesus Christ, we praise you and adore you. Like Francis, we are amazed that you held nothing back from us in pouring yourself out for us so totally through your holy wounds on the cross. We ask you to breathe forth your Holy Spirit into us and set our hearts on fire, so that, with the Spirit’s help, we might respond more fully to you. Amen. This weekend marks the second anniversary of Father Gareth and myself arriving in St. Mungo’s to take up our roles in the parish. It’s hard to believe that two years have passed since then. In some ways the time has passed very quickly, and in other ways it seems like we’ve never been anywhere else. The warm welcome we received at the beginning has never waned and, if anything, people are even more encouraging and supportive than ever, even though Father Gareth’s jokes have never changed in all that time, so we are very grateful for that. Since then, of course, Brother Antony has arrived in the community to make a great contribution and, together with Father Lawrence and Father Justinian, that makes five of us. As I’ve said before, we like our accommodation in Bishopbriggs, even though there are now five of us in a four-bedroom house, with a downstairs den having been converted into an extra en-suite, and most of the time the commute to and from St. Mungo’s is not too arduous, and, while not ideal, we are used to our meal times being a bit ad hoc, especially when we try and sit down all together. However, when Father Gary was here recently conducting the Novena to Our Lady of Sorrows, we experienced more fully the limitations of our situation. In the first instance we had no visitor’s room to give him, and so I asked a neighbouring parish priest, whose brother is married to my niece, could he put him up, to which he kindly agreed. On the day Father Gary arrived I collected him at the airport and brought him to St. Mungo’s to get a sense of the church as he would begin preaching the next day. We then went shopping to get him a few things for breakfast and for a night time snack, should he feel so inclined, and I brought him to his temporary abode to get him settled in. Every morning either myself; Father Gareth or Brother Antony would go and collect Father Gary after breakfast and bring him to the church to prepare for the mid-day Novena Mass. We would then have to decide where to go and get some dinner. For the first couple of days we manged to eat out at Bishopbriggs. On the Sunday we had kindly been given two hospitality tickets for a charity match at Celtic Park and so Brother Antony and Father Gary were able to feast themselves on the buffet before and after the match. On the Monday we went to the local pub near St. Mungo’s where I ordered sausage and mash. When it came there were five big Cumberland sausages embedded on a mountain of mash – I hadn’t realised there was a Monday special that I think was intended for Desperate Dan. The others had something more manageable. We went back there on the Friday when we all had fish and chips. The other meal times were spent in various little cafes eating pasta or burgers, whatever was cheap and tasty, and we made the most of the sausage rolls at the closing buffet in the hall after the final Mass. It was a week in which we probably upheld Glasgow’s reputation for (un)healthy eating, but, in the end, we turned it into an adventure and we had some great chats and laughs together before Father Gary would have a little rest and get himself ready for the evening Novena Mass. Occasionally after the evening Mass we would indulge in an ice-cream on the way home and take time to discuss how things were going. Father Gary, it has to be said, was very amenable and fully appreciated our situation and, in the end, I would say he actually enjoyed the chaos, the improvisation, the company, the encouragement, and the support. Perhaps the highlight for him though, apart from the Novena itself, in which he was genuinely fulsome in his praise of the faith of the people who attended, and the affirmation he received, was on the closing day, the Feast of Our Lady of Sorrows, when, in between the two sessions, he was able to fulfil a lifetime ambition and, once again accompanied by Brother Antony, take in the Celtic Park Stadium Tour. During my recent visit to Dublin I was talking to three of our men who were preparing to head for Rome for our Passionist General Chapter which begins on 6th October and continues for three weeks. One is going as our Provincial; another as the moderator of the Chapter, and a third to be part of a team of simultaneous translators. A General Chapter is a gathering of the leadership of the Congregation from throughout the world to reflect on our life and work as Passionists. It takes place every six years and this time they will be gathering under the headline theme of Renewing Our Mission: Gratitude; Prophecy and Hope. I was only ever once present at a General Chapter and that was back in 1982. I had just completed my Theology degree in Dublin and taken my final vows as a Passionist at Mount Argus, and I was heading out to Rome for an academic year to take a course in Pastoral Theology at the Gregorian University; to be ordained a deacon in our mother house of Saints John and Paul; and to make preparation for my ordination as a Passionist priest which was scheduled to take place in St. Mungo’s the following summer. Once there, whenever I was free from classes, I would be invited to take part in the General Chapter as an observer. It was a General Chapter with a difference in that, after the Second Vatican Council, religious orders were asked to go back to the charism of their founders and, in the light of that, to revise their Rules and Constitutions. An experimental period was granted and this General Chapter was intended to agree and finalise these new Rules and Constitutions. It was to last six weeks instead of the usual three and, by the end of it, you could see that some of the men were getting cabin fever and couldn’t wait to get back to their own countries and provinces, but for me it was a great opportunity to get to know Passionists from all over the world and to experience a real sense of what it means to be part of an international Congregation. I may have told this story before in a different context, but I remember a very funny experience I had on the journey out to Rome. The Provincial Bursar at the time, presumably to save money, had devised a rather tortuous itinerary for me. He had got me a ticket on a charter flight from Dublin to Gatwick; from there I was to get a bus into London; I then had to get another bus out to Luton Airport, and from there I would fly to Rome, Ciampino, which at that time was a much smaller operation than it is now, and a good distance out of the city, so, I was relying on some kindly Passionist picking me up from there to bring me to Saints John and Paul’s. I was carrying enough luggage to last me a year, including some necessary books, so having all these changes was a bit of a chore. For some years previously I had been involved in an organisation called CASA, the Caring and Sharing Association, which works with and supports people with disabilities; physical, sensory and intellectual; of all ages, and from all backgrounds. It had been a wonderful part of my life and my formation. I had just checked in my luggage, a much simpler procedure then than it is now, and gone through to departures, when, for the first and only time in my life, I heard my name being called out over the speakers, asking me to return to the check-in area. Wondering what was wrong I made my way back, only to discover a group from CASA waiting to wave me off and presenting me with a teddy bear that was as big as myself. This had to be checked in as well and I must confess, not wanting to trek through London with this monstrous cuddly toy, and not wanting to be greeted in Rome by some surly Italian wondering what in God’s name I was bringing with me, I spotted and asked a mother at Gatwick Airport if she thought her young daughter who was travelling with her might like this furry beast. To the child’s delight, and to my relief, she said yes, of course, and I continued on my way bear-free. Please pray with us for our 2018 General Chapter: Let our Passionist General Chapter be a motivation for permanent personal conversion and for a creative rethinking of our life and our work. Renew the Passionist mission and make of us the new wine of a new Church. Amen. I had to travel to Ireland last week for two meetings, one in Dublin on Tuesday, and the other in Belfast on Wednesday. I’ve no doubt that when I say in this log from time to time that I was over in Ireland for meetings, there will be some who think “lucky him”, however the reality is that, setting aside the fact that meetings are often tedious, short haul travel is not always all that pleasant. These two days last week, for example, coincided with Storm Ali. The journey to Dublin had been okay but the storm was in full force on Wednesday morning when myself and Fr. Eugene, the rector of Holy Cross, Ardoyne, where the meeting was taking place, left Dublin for Belfast, and it took us a long time to get out of the city. At one stage, as we were driving through a tree-lined section of the road. we found ourselves assailed by conkers blowing off the trees and battering our windscreen. For a while it was a wee bit scary as we felt the windscreen was going to come crashing in on us at any moment. All along the road we saw signs telling as that it was European Day Without A Road Death. The idea was that no one should die on the roads of Europe on that very day, Wednesday 19th September, and in the lead up to it road users were asked to think about the risks they face, the risks they pose to others, and how they can go about reducing those risks. Issues highlighted were speeding, drink-driving, not wearing a seat belt, using the phone while driving, using vehicles that haven’t been kept roadworthy, parking cars on bicycle lanes, blocking pedestrian crossings, not turning on lights, and engaging in risky manoeuvres. Nobody said anything about avoiding flying conkers. I don’t know how the day went but please God it was a success and there were in fact no road deaths, although I doubt it as I witnessed many selfish people on the day taking those very risks, especially using their phones, and I do know that at least two people died in Ireland as a direct result of Storm Ali. The middle part of the journey was okay, although we did experience the car being buffeted by winds on high sections of the road around Newry. When we reached Lisburn, however, and tried to get onto the M1 into Belfast, everything came to a standstill. Traffic was either crawling or not moving at all. We put the radio on and heard that some electrical cables had been blown down and that part of the motorway was closed. We had no option but to stick with it and, as a result, our final section of the journey, that should have taken around 15 minutes, in fact took us an hour and 15 minutes. After the meeting I was supposed to get dropped off at Dublin Airport to fly home to Glasgow, but the person who was to bring me, on finding the M1 closed, had abandoned their journey and returned to Dublin. I was then dropped off at Belfast Bus Station to get a bus to the airport. I got my ticket and was told which platform the bus would leave from. I saw a bus with Airport Express written on the side and got on. Just before it took off it occurred to me that many of the people on the bus didn’t look as if they were travelling very far; it turned out I was on a bus to Belfast Airport with local stops along the way. I was just in time to hop off and jump on to the right bus. When I arrived at a very crowded Dublin Airport I was still wondering if my plane would take off at all, as I knew that many flights had been cancelled during the day. Luckily, Storm Ali had abated enough for the flight to be enabled, although it was going to be delayed by about an hour and a half. An egg sandwich, a Bounty Bar, and about 100 pages of my novel later, I was at last Glasgow bound, and I was grateful to Brother Antony for collecting me at Buchanan Bus Station and having me home in Bishopbriggs before midnight. So, the next time I head to Ireland for meetings, don’t say “lucky him”, say “poor him”. Almighty God, creator of all, like the disciples who were caught in the midst of a mighty storm, we ask you to come to our aid. We feel small and helpless before the great power of a storm, and so we place our trust in You, to shelter us, and to lead us to safe harbour, Amen.